Knowing how to use witchcraft symbols in your spells can be an easy way to add some additional energy and purpose to your magick. 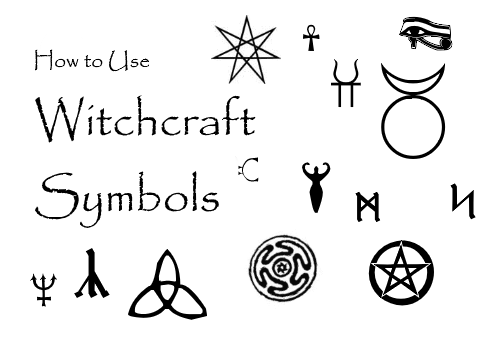 Of course you need to know what the various symbols mean in the first place, but I'm more talking about the ways you can work symbols into spells. This is the most obvious way to add witchcraft symbols to spells. The written word is a very effective method for making your purpose very clear, and symbols can be part of that. All you need to do is draw out a symbol by hand with pencil, chalk, paint or even blood on any sort of material that works of your spell. With a sharp instrument (not your athame blade), carve your symbols into a candle before you burn for a spell. It works best if you have a big fat pillar candle with a lot of surface area to work with, but if you are careful, you can carve a symbol or two onto the smallest tea light or slim taper. What I mean by this is that you actually lay items out on a altar to make a symbol. It's not quite the same as writing it, so I figured I should mention it separately. Things like setting out candles in the shape of a pentacle, or making a zodiac sign with salt would be this type of approach. It's less permanent and can create a larger foundation for your spell. We are talking about any sort of magickal or occult symbols here, not just the usual Wiccan symbols. You can either use symbols that can be translated to letters (like runes, ogham or even Enochian) and just write out your spell intentions, or take a less literal route and chose symbols that simply represent your needs. In that case, you can work with astrological, planetary, sigils or alchemy symbols as well as the usual runes. I say runes twice because you can use them as letters as well as symbolic icons. Veves are very potent symbols if you work in Voodoo style rituals.